Montagnard Spring Roll Tips – Anything Goes! 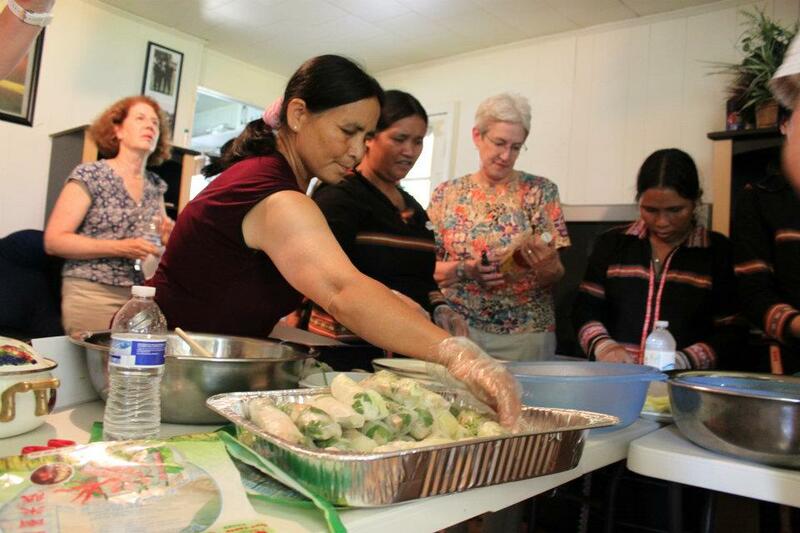 I can’t tell you how fun it was making authentic spring rolls with the Women’s Learning Group last weekend in the Rosewood Neighborhood. Since moving to Greensboro, I’ve become a huge fan of fresh spring rolls and have attempted making them in my home several times. It was great to learn first hand from the experts! And, I also loved knowing that there are other women out there who cook by the seat of their pants (for those who have ever cooked with me and without measuring spoons!). Their main point was – “anything goes with spring rolls” and suggested a number of possibilities when making them. The organizers of the trip sent us home with an information sheet on “The Montagnard Perspective.” Here are some point that may be of interest in your spring roll making! Traditional Montagnard dishes include wild plants, mushrooms and other foods found in jungles and forests. Spring rolls are “anything you want” in a wrapper. You can even buy gluten-free rice flour wrappers! You can’t go wrong if you stick with quality and fresh vegetables and herbs. Ideas for spring roll ingredients are: red leaf or boston lettuce, thin rice vermicelli, shredded carrots, bean sprouts, cooked shrimp, cucumber, grilled pork, mint, cilantro, balm or perilla. Dipping sauces are important and come in a number of varieties. Here are two recipes! Finally, supporting ethnic businesses in Greensboro – is buying local! Here are a couple places to check out. Wow. That’s great. Thanks for the recipes.